A selection of archived materials compiled for this timeline by local journalist Lee Hancock and The Tyler Loop. Last month’s violent white supremacist protests in Charlottesville, Virginia reawakened a 50-year-old debate over Tyler’s Robert E. Lee High School. A recent school board meeting attended by nearly 300 people has demonstrated that Tylerites need better access to local history on this matter. Most people who attended the August meeting might not know Tyler has been here before. In 1971, black Robert E. Lee students and parents repeatedly asked the Tyler Independent School District to rename the school. During a momentous school board meeting attended by nearly 400, a parent told the board that “black students at Lee feel the Civil War is fought over and over again each year between September and May.” Ultimately, the board kept the name. Now, 50 years later, the city of Tyler is grappling with the same question. If we wish to settle the debate this time around, Tylerites — from school board members to current students, passionate alums to recent transplants — will need to understand how we got here. To that end, The Tyler Loop, in collaboration with former veteran Dallas Morning News reporter and longtime Tyler resident Lee Hancock, has taken a deep dive into Tyler’s history of race and education. 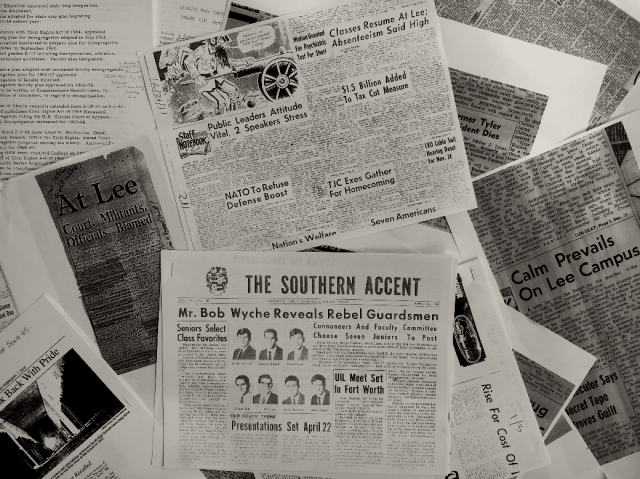 We have compiled a timeline from 130 years of local news reports, yearbooks, school board minutes, court filings and regional histories, with original sources for each timeline entry. You can see those citations here. We begin our timeline not in 1958, when Lee first opened as an all-white school, but further back, when Tyler’s first segregated schools were founded. We explain how anger over desegregation in other Texas cities and across the South affected the decisions of white leaders in Tyler. We include information about other race-related court cases fought here in Tyler, both because those fights impacted Tyler and to provide context about our city’s role in shaping the statewide and even national fight over desegregation. And we show that none of these decisions was made in a vacuum, or in a casual fashion. School names, mascots, colors: these symbols are heavy with meaning, and they were intended to send a message. We know, because the archives preserve the words of those who selected and cherished them. Race has been a charged issue in Tyler’s public education since the first schools opened here. Like their counterparts across the South, white Tyler leaders enforced segregation and funneled more resources to white schools. Tyler’s black community, denied meaningful say in local decisions, pushed for decent black schools. Starting in the 1920s, blacks rallied around a flagship high school of their own, named for a pioneering black educator. Go to next chapter, or read more of this history below. See original sources for all entries here. The first class graduates from all-white Tyler High School. After a committee of black leaders asks for “a suitable school house” for black students, the city opens West End School for first through tenth grades in a four-room building on Herndon Avenue. West End School burns down, and a new school for black students is built on Border Street. It’s named Emmett J. Scott Junior High, and its mascot is the Bulldog. Emmett J. Scott was a Houston native, an administrator at Tuskegee Institute under Booker T. Washington, and a special assistant to the U.S. Secretary of War in World War I. The updated city plan recommends removing Emmett Scott High School from Border Street and building a new school and park several blocks west to protect Tyler’s “present dividing line between whites and negroes.” Both recommendations are carried out. The school board discusses a $225,000 stadium for Tyler’s white high schools and junior college. The district can avoid the expense of a cheap field for black schools if they’re allowed to use the new stadium, too, an official says. This will work, he tells the board, if the new stadium is “erected away from the center of the population” of white Tyler. In September, the new Emmett Scott Senior High opens on Lincoln Street between North Confederate Avenue and North Englewood. Over the next 20 years, 12,000 black students will pass through its halls. Tyler makes national news as Texas officials launch a court fight here to counterattack legal assaults on Southern segregation. The state lawsuit comes two years after the N.A.A.C.P.’s historic win in Brown v. Board of Education, amid a wave of integration lawsuits in Texas and across the South. The Tyler court ultimately bans the N.A.A.C.P. from the state of Texas. That ruling will come just before Tyler school officials decide to name their new white high school after Robert E. Lee. Across the South in the ‘50s and ‘60s, new monuments are erected and new buildings are named to honor Confederate generals and history. The trend is widely seen — and even openly declared by some Southern leaders — as white backlash against the civil rights movement. Go to next chapter or read more about this history below, and see original sources for all entries here. The U.S. Supreme Court rules that segregated schools are unconstitutional in Brown v. Board of Education. It is a historic win for the N.A.A.C.P. and its chief lawyer, future U.S. Supreme Court Justice Thurgood Marshall. In Tyler, black community leaders had enlisted state N.A.A.C.P. lawyers in an groundbreaking — though ultimately unsuccessful — earlier civil rights case, a federal lawsuit asking that black families be allowed to use Tyler State Park. Newspapers in Tyler follow legal battles and vows of white resistance across the South, running these stories as front-page news. The all-white Tyler school board says its integration policy will be the “same as last year,” meaning that total segregation will continue in Tyler schools. A federal judge in North Texas issues the state’s first desegregation order in a lawsuit brought by an NAACP-affiliated lawyer. White mobs repeatedly gather to block black students from entering a school in the North Texas town of Mansfield. Texas Gov. Allen Shivers sends Texas Rangers to back the school district’s defiance of the federal desegregation order. The crisis makes front-page headlines in Tyler. On September 21, the Texas Attorney General files suit in Smith County District Court demanding closure of N.A.A.C.P. offices and chapters statewide. He alleges N.A.A.C.P. officials “exceeded the bounds of propriety and law” by recruiting clients for desegregation lawsuits, engaging in political activity and seeking to integrate Texas public schools. State officials choose politically friendly, staunchly pro-segregation Tyler as a favorable venue.The same day they file their suit, the Tyler state judge issues an emergency order: the N.A.A.C.P. must cease all activities in Texas. N.A.A.C.P. officials say the governor and attorney general are pandering to segregationists and denying black Texans their constitutional rights. On September 27, the eve of what Tyler newspapers term a “life or death” hearing for the N.A.A.C.P., the Texas governor’s segregation commission calls for new laws mandating school segregation and prosecution of blacks who try to enroll in white schools. That makes front-page news in Tyler. On Oct 23, a Tyler state district judge extends his initial order, ordering the N.A.A.C.P. to cease operations in Texas. In April, the Tyler school board approves a $213,000 addition at Emmett Scott Senior High and a new $2.2 million white high school in South Tyler. After more hearings and legal defeats for the N.A.A.C.P. in Tyler state court, N.A.A.C.P. chief counsel Thurgood Marshall negotiates a compromise with the new Texas Attorney general. The organization agrees to limit itself to educational and charitable work in Texas. Though the organization will continue in Texas, its momentum will slow significantly both statewide and in places like Tyler, where adverse effects of the court fight reverberate for years. In coming months, some in the black community will see the school board’s decision to name the new white high school after Confederate General Robert E. Lee as a further rebuke of civil rights activism by groups like the N.A.A.C.P. and as a signal that Tyler whites have no intention of integrating the city’s schools. Chapter Three: What’s in a name? Tyler school officials name the city’s new high school Robert E. Lee High. For the next twelve years, the school’s white student body will be deeply immersed in Old South mythology as local leaders resist federal government demands to speed up desegregation. Go to next chapter or read on below, and see original sources for all entries here. In October, the Tyler school board discusses naming Tyler’s new white high school South Tyler High and the existing white school Central High. On Nov. 11, citing “extremely strong opposition” to the names South Tyler High and Central Tyler High, the school board leans toward naming the new white high school after Robert E. Lee or Benjamin Franklin. A decision is postponed for student input. On Dec. 11, a Tyler Courier Times editorial urges the Tyler School Board to name the new white high school after the Alamo. On Dec. 12, the Tyler school board considers 50 names proposed by white students for the new school. After several board votes, members agree to name it Robert E. Lee High School and the old high school John Tyler High School. An assistant principal for the soon-to-open Robert E. Lee High tells the school board that there isn’t yet a clear winner for school colors and a mascot from the new school’s prospective students. In student voting, orange and white beat red and white by just a dozen votes and black and white by a large margin. As for the mascot, the Rebel got 170 mascot votes, Travelers 105 votes, and Lancers 70 votes. Left unsaid in the summary of the board’s discussion is the likely dilemma posed by the students’ top color choices: what would local Texas A&M and Baylor grads say about orange and white — University of Texas colors? The board tells the high school’s principal to hold a runoff vote for colors as well as for a mascot. In June, TISD officials announce a “stair-step plan” for desegregation, starting with kindergarten and first grade. The plan calls for moving up each year’s integrated group of kindergarteners and first graders until every grade is desegregated. The U.S. Civil Rights Act is signed into law by President Lyndon Johnson, banning racial discrimination in all public accommodations. The act mandates termination of funding for segregated school systems and authorizes the Department of Justice to bring federal lawsuits to enforce integration of public schools. The federal Department of Health, Education and Welfare is tasked with developing and enforcing desegregation plans for school districts across the country. TISD begins allowing students to voluntarily transfer between local schools regardless of race, as part of its “freedom of choice” desegregation plan. In July and August, shortly after federal officials warn TISD that its plan for integrating faculty is insufficient and its desegregation of its schools is moving too slowly, the school board approves a ten-year plan for fully integrating black and white faculty in Tyler schools. The Federal Department of Health, Education and Welfare (HEW) again warns the Tyler School District that its desegregation efforts are moving too slowly. In January, the school board approves retaining the “freedom of choice” desegregation plan, allowing students and parents to transfer voluntarily to schools outside their neighborhoods on a limited basis for the coming school year. In February, TISD receives a letter from the federal HEW regional office that the Tyler desegregation plan is unacceptable. The board is on notice that a fight is on the horizon: HEW is forwarding TISD’s case to Washington. The same month, the TISD board approves moving four teachers from all-black Emmett Scott high school to all-white Robert E. Lee High School. In April, Dr. Martin Edwards is the first black person elected to the TISD board. After years of delay by white school officials, immediate desegregation will be imposed on Tyler schools by U.S. District Judge William Wayne Justice. The judge will be hated by many white Tylerites — and considered a hero by many blacks residents — for also forcing out Lee’s Rebel mascot and Confederate regalia and ordering fair elections of cheerleaders at John Tyler High. But one symbol will remain: the school board rebuffs pleas from black students and parents to change the name of Robert E. Lee High School. The black community pays a devastating price in this fight: the school board insists on closing their beloved all-black Emmett J. Scott High School. Go to final chapter or read this history below. See original sources for all entries here. In March, the Department of Justice (DOJ) takes the unprecedented step of filing a desegregation suit against an entire state, suing the state of Texas and its Texas Education Agency. U.S. District Judge William Wayne Justice is assigned to hear the case. In May, a Justice Department lawyer tells Tyler school officials that the DOJ has received a written complaint, submitted by multiple residents, that black children in Tyler schools are being deprived of their constitutional rights. The decision by local families to complain to DOJ signals that the Tyler district should soon expect a legal challenge from the DOJ’s Civil Rights Division. On July 15, the Justice Department files a desegregation lawsuit against TISD in federal court in Tyler. The action asks U.S. District Judge William Wayne Justice to order immediate, “total and complete integration,” citing years of delays by Tyler school officials. Officials from the U.S. Department of Health, Education and Welfare tell the judge they tried to persuade the district to convert all-black Emmett Scott High School to an integrated junior high school. TISD’s lawyer and superintendent argue that Emmett Scott and two other black schools must be closed in any new desegregation plan. The lone black member of the school board hires his own lawyer and asks Judge Justice to accept HEW’s recommendations to save Emmett Scott. On July 25, U.S. District Judge William Wayne Justice hears testimony on the TISD integration lawsuit. An attorney for the Justice Department’s Civil Rights Division argues that TISD’s proposal to close Emmett Scott and convert a black junior high and elementary school to limited uses is “racially motivated,” particularly given that the district has asked to keep open older, formerly whites-only buildings. An expert with the federal Department of Health, Education and Welfare testifies that Tyler’s plan does not make financial sense, as it would abandon useable classroom space for 2,000 students while requiring the district to spend money for replacement facilities. In late July, Judge Justice orders immediate integration following HEW’s plan, including keeping Emmett Scott open. At a school board meeting, black residents ask to change the names of both Robert E. Lee and John Tyler High schools. Board minute summaries do not record what was said by the black constituents, or how the board members responded. Later in the meeting, board members ask the school district’s lawyer to appeal Judge Justice’s desegregation ruling. In August, after more negotiations with HEW, TISD asks Judge Justice once more to close Emmett Scott and transfer its students to John Tyler and Lee. This time, HEW doesn’t object, and the judge accepts TISD’s plea. Later, Judge Justice will tell his biographer that he had “ambivalent feelings” about these compromises, “but it did accomplish what I was demanding” — the desegregation of Tyler’s schools — and there was little time to do anything else before the start of the new school year..
On Aug. 6, a 21-year-old black man named Lincoln Ashford comes to a Tyler school board budget meeting and, with a few others, asks to discuss changing the name of Robert E. Lee High School. Ashford and the others, who say they’re members of a group called the Black Liberation Front, are told to put their request in writing. At an Aug. 13 school board meeting, an out-of-town lawyer speaking for the Black Liberation Front asks the board to change the name of Robert E. Lee High School. An audience of more than 400 listens in the boardroom, and loudspeakers broadcast the meeting to people gathered outside. The attorney presents the board with a petition from 500 black Tylerites requesting a meeting with school officials to ensure fair treatment of all students. After listening to the requests, a white board member moves “that the name of Robert E. Lee High School remain unchanged for the present time.” Other white board members ask to delay any vote on REL’s name and the motion is tabled. Halfway through the meeting, about half of the audience in the packed board room walks out, though newspaper accounts don’t say why. On Aug. 31, after a five-day delay approved by Judge Justice, Tyler schools open for the new school year. On Sept. 24, in one of the nation’s most sweeping integration orders, Judge Justice rules that the state of Texas and its education agency failed to provide equal opportunities for public education without regard to race. He places most of the state’s schools under his supervision for desegregation and orders the Texas Education Agency (TEA) to ensure local districts across the state comply with his desegregation orders. Over 1,100 school districts and two-thirds of all Texas students will be overseen by the judge. The case sets the stage for TEA to take action in Tyler over complaints about school symbols at Tyler’s Robert E. Lee High School. On March 24, 250 to 300 black students walk out of John Tyler High to protest the school’s cheerleader election. Before the walkout, black students had complained that the election unfairly reserved four positions for whites while giving only two to blacks. The students reject school officials’ explanation that the distribution reflected the percentages of whites and blacks in the school. On March 29, black parents file a federal lawsuit in the wake of the John Tyler cheerleader walkout. The lawsuit seeks to stop school officials from keeping walkout participants from coming back to school; the district was requiring them to first undergo interrogation about their roles in the protests. U.S. District Judge William Wayne Justice grants a restraining order allowing the black students to return to school. On Oct. 14, four students representing black students at Lee present the school board with a petition to change the school’s Confederate symbols and name. Student Pat Raibon tells the board that asking black students to honor the Confederate flag as a school symbol is akin to asking Jewish students to honor Hitler and the Nazi flag. Raibon suggests naming the school after white philanthropist D.K. Caldwell, founder of the Tyler Zoo, saying it would make the school feel welcoming to all students. The board refers the request to court-created biracial committees. At the pep rally, ‘Dixie’ is sung again, and black students wave pieces of shredded Confederate flags. Some black students turn thumbs down and others boo. When the American flag is brought into the gym for the national anthem, the paper reports, most students sing along, but about 20 black students “raised their right arms, fists clinched in the symbol of black power.” There is a shouting match between black students and white students, and someone sets off two firecrackers near the black students before relative order is restored. Afterward, about 100 black students stand outside the cafeteria and block the entrance. Tyler ISD officials take photos and videos of the black students “as evidence in the event there had been any trouble,” while “faculty members, backed by city police,” tell the group to go to class. After about ten minutes, the black students disperse. On Nov. 18, school board members refuse to vote on recommendations from the court-created biracial committees of students, parents, and faculty. The committees had recommended that the school retire Lee’s mascot and and other Confederate symbols, citing recent disturbances at the high school. Several hundred people pack the boardroom, and at least a hundred more stand outside to hear a broadcast of the meeting. One board member says black students don’t deserve the right to ask for changes after the spate of fights at the school. On Dec. 16, TISD board members meet with Texas Education Agency representatives to discuss Robert E. Lee High School’s symbols. Citing Judge Justice’s order that TEA must ensure school symbols don’t discriminate or upset racial harmony, TEA officials say the district must get rid of Confederate symbols. Refusal would cost TISD accreditation and $800,000 in state funding. In January, Tyler school board members again meet with Texas Education Agency officials to discuss a complaint TEA has received about Lee’s symbols. A summary of board minutes states that it’s “proved” in the meeting “that the Lee cannon was not a Confederate cannon.” TEA tells Tyler school officials that all other symbols and items in question must go. On Jan. 14, the school board votes 5-2 to get rid of the Rebel mascot, Confederate flags, ‘Dixie’ fight song, Rebelettes drill team, and other Confederate symbols. They also vote unanimously to keep the school’s name. In the morning, Lee teachers fan out across the campus to strip classrooms and halls of anything that might be seen as Confederate imagery. Officials also make plans to strip away a large mosaic in the school lobby and Rebel symbols on the gym floor. Local newspapers describe some white female students crying, other white students venting, and some students of different races appearing to accept the changes. Some students tell a local reporter it will be hard to come up with a new mascot and symbols that don’t reflect General Lee’s Confederate history. The next day, without explanation, Lee’s principal tells local reporters that Bulldogs have been dropped from the final student runoff vote for the high school’s new mascot. The next mascot vote will be between Red Raiders and Southerners. On Feb. 3, students pick Red Raiders over Southerners as Lee’s new mascot. Lee’s principal refuses to reveal the final vote numbers, saying only that 125 fewer students had voted in the final round than in earlier rounds of voting. The afternoon newspaper’s article notes that the principal “didn’t know if some students did not vote in today’s election or whether there were that many students absent due to the cold weather.” At Tyler’s Pounds Field, the low that day was 38 degrees and the high was 58. With the Red Raider mascot selected, REL’s principal tells reporters, student committees will begin choosing the Red Raiders mascot’s appearance, selecting a new fight song, and picking new names for the drill team and the guards assigned to fire the school cannon. On Feb. 21, the Tyler School Board is told that “by majority vote,” Lee’s student body chose “Red Raiders.” That means new band uniforms without Confederate stars-and-bars are needed, school board minutes note. The board approves the purchase, voting to ask for federal funds to pay for them. Opening a new battle over inclusion in Tyler schools, Tyler’s school board refuses entry to any undocumented students who can’t pay $1,000 a year to attend school, citing a recent Texas law allowing public schools to charge tuition to children of undocumented immigrants. Hispanic families file suit before U.S. District Judge William Wayne Justice. In a landmark 1982 decision, the U.S. Supreme Court will uphold Judge Justice’s ban of the tuition requirement and declare that all children, citizens and undocumented alike, have a right to free public school education. Racial divides linger in Tyler, along with ghosts of a misremembered Confederate past. Black Emmett Scott alums continue to mourn their school. Some Lee alums still resent the loss of their Confederate school symbols. All these losses, and all the stories told and silenced, permeate renewed debate over the name of Robert E. Lee High. On Feb. 16, hundreds of Lee students walk out of school over two days after a white sophomore comes to school wearing a T-shirt featuring a Confederate flag and the slogan: “It’s a white thing. You wouldn’t understand.” Teachers declare the T-shirt racially offensive and tell the student to take it off. Students leave classes and gather in segregated clusters in Lee’s courtyard. The incident makes headlines across Texas. The old Emmett Scott school building — now rat-infested, weed-choked and asbestos-ridden — is red-tagged for demolition at a black city councilman’s request. “Everybody says renovate, but how do you do that without any money?” councilman Derrick Choice tells the Tyler paper. Some community leaders and Scott alumni want the building preserved as an important part of Tyler’s history. Others want it torn down so the underlying land can to be given to Texas College. Scotties’ legacy can be honored, they say, with a historic marker and by re-using the land for a new educational building. U.S. District Judge William Wayne Justice, who along with his wife was largely ostracized in Tyler after his desegregation order, steps down from his full-time judgeship in Tyler and moves to Austin. Among the few cases he keeps under his supervision is the 1970 Tyler Independent School District desegregation case. “I wouldn’t want them to forget me entirely,” he tells the Dallas Morning News. Emmett J. Scott Park is dedicated at the intersection of Confederate Avenue and West Vance Street. Former Scott students remember with sadness having to trade their maroon and white colors for “Robert E. Lee red and John Tyler blue.” A memorial plaque honoring Scott alumni says the park was originally called Lincoln Park. The park, along with Emmett J. Scott High School, had been strategically located in that spot by an earlier generation of white Tyler leaders to stop black neighborhoods from spreading into white ones. In mid-August, Tyler Hispanic minister D.G. Montalvo announces on Facebook a campaign to change the name of Robert E. Lee High School. He tells local media that the recent violence over Confederate statues in Charlottesville, Virginia, offers Tyler an opportunity to address racial tension and heal divisions. “It’s the right time,” he says. On Instagram and SnapChat, current students at Robert E. Lee hotly debate the issue. Unlike white Lee students, the Rev. Mast tells the board, Emmett J. Scott High School students never got a say in what happened to their school. White Tyler leaders terminated their school, mascot, and traditions behind closed doors, and Scotties weren’t told until it was too late. Written and researched by Lee Hancock. Edited by Tasneem Raja. Note: a previous version of this article incorrectly said last month’s white supremacist protests happened in North Carolina, not Virginia. We regret the error.